Thank you for your interest in American Heritage Girls! Each level may be divided further into squads based on ages and number of girls. We maintain proper leader/girl ratios and two-deep coverage at all times. Like in most other scouting troops, our girls work on badges (there are over 240 to choose from!) in the following topics: Heritage, Family Living, Arts, Outdoor Skills, Personal Well-Being, and Science and technology. There are also religious awards that can be achieved at each level. 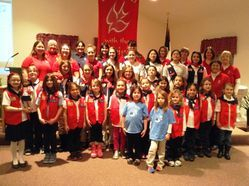 The girls will also work on service projects, as service to God, family, country, and community is the focus of the American Heritage Girls. We will go camping and on other outings, and of course fellowship with other girls in a safe and fun environment is part of everything we do!